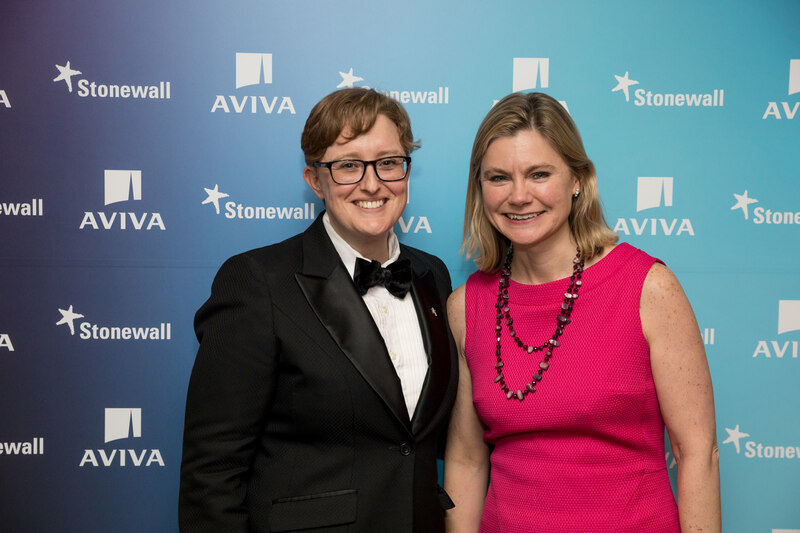 The Stonewall Equality Dinner, kindly supported by Aviva, took place on Friday 24 March 2017. Speakers on the night included Stonewall CEO Ruth Hunt, Secretary of State for Education Justine Greening and Chair of Stonewall’s Board of Trustees and Group Brand Director at Aviva, Jan Gooding. Writer Amy Lamé made her dazzling return as auctioneer for the night at the Hilton, Park Lane. London’s new night czar helped oversee the evening’s entertainment which included a live auction, silent auction and raffle. There was also a moving speech given by Stonewall volunteer Philip Adlem, who regularly inspires young people as a Stonewall Role Model spoke of his difficult experiences of growing up LGBT. This year marks the 50th anniversary of partial decriminalisation. Top auction prizes included a selection of exclusive experiences, including VIP tickets for the upcoming Steps tour, a stay on 5th Avenue over New York City Pride Weekend, tickets to the sold-out show ‘Angels in America’, and even a pair of Tom Daley’s swimming trunks. Guests on the night included the event’s host Stella Duffy, Stonewall founders Sir Ian McKellen, Olivette Cole and Lord Cashman, singer Sinitta, artist Maggi Hambling, authors Jeanette Winterson and Val McDermid, Antony Cotton, Sean Tully in Coronation Street and rugby star Keegan Hirst, who plays for Wakefield Trinity. We’re already excited for next year’s dinner – be sure to check back here for more details.